The least expensive Smartwatch ever? One of the great unsung pioneers of contemporary British folk song, Austin John Marshall, died in his sleep in New York on Sunday, November 3. 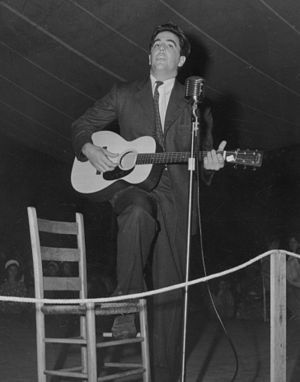 When Shirley Collins returned from the States, where she’d been collecting with Alan Lomax, she married Austin John, who played a very significant role in her involvement with Davey Graham – which, incidentally, influenced Bob Dylan. It was perhaps appropriate that Austin John Marshall should have died just before the eve of Remembrance Sunday, for he composed perhaps the most wonderful peace song ever, The Whitsun Dance, which I published for the first time in my song collection, The Cruel Wars (1973). I sang Austin John’s song, ‘Dancing at Whitsun’, in the Castle pub, Bradford, on November 8, 2013. For ’tis now a holiday. Tim Hart and Maddy Prior recorded Dancing at Whitsun in 1971 for their third duo album, Summer Solstice , and June Tabor sang it, accompanied by Tim Hart on guitar, on a BBC Radio 1 John Peel Session recorded on March 4, 1975 and broadcast on March 10, 1975. I don’t know if this recording has ever been released on an album. As green as her memories of loving. Where once she was pledged to her true love. No young men to tend them, or pastures go see. Had gone to be wasted in battle. Marched husbands and brothers and fathers and sons. And the ladies go dancing at Whitsun. Are covering the Downs where the sheep used to graze. There’s a field of red poppies, a wreath from the Queen. In my notes to The Electric Muse 4-LP boxed set, I told the story of how he put Shirley and Davey together, changing the whole face of English popular music for ever. In July 1964, Austin John Marshall had the unobvious idea of teaming up his wife Shirley, with the guitarist Davey Graham. Shirley had been a mainstay of the British revival since the earliest Ballads and Blues days, and had worked with Ewan MacColl, Peter Kennedy and Alan Lomax in the performance, collection and annotation of Anglo-American folksong. The idea stemmed only partly from Marshall’s own eclectic tastes; partly also from the fact that the implosive effects of cheap travel and the instant access through electronic media were causing all the world’s cultures to cross-fertilise and become, not one, but an even wider variety of hybrids. The first result of the Collins-Graham collaboration was this raga arrangement of a tune Shirley had put to traditional American words. Shirley and Davey gave a concert at the Mercury Theatre and followed it with another one at Cecil Sharp House. A couple of the recordings I had made before I left [UK to go to USA with Alan Lomax] were going to be used on the HMV compilation albums A Pinch of Salt and A Jug Of Punch. John, who was working at Vogue magazine at the time as an art assistant designed the covers and he was at Peter Kennedy’s house one day when I was there. We got married within a couple of years. I knew Davey from the folk clubs because he was playing at places like the Troubadour in London. But it hadn’t occurred to me to work with Davey because he was on this very exciting love affair with Middle Eastern and Indian music. John was very keen on jazz, which as I’ve said before I don’t like. I think it was after we heard Davey’s sort of raga version of She Moved Through The Fair, the Irish song, that John had a brainwave and thought that it might be intriguing for Davy and I to work together. It didn’t detract from the English or American songs, it just added a further dimension to the tunes. Davey just came out to our house at Black Heath and played in the front room and we sang and then we gigged. Some of it is very good I’m a tad embarrassed by one or two tracks, but I think when it worked, it worked very well. Austin John Marshall was a true Renaissance man, with innumerable talents. Though originally a designer and graphic artist, he pushed the boundaries of whatever medium he worked in. For instance, when he put together the video of Jimi Hendrix viewable in the Youtube playlist above, he applied the audio technique of feedback to the video image, with results that have never been equalled. Screenshot from the Jimi Hendrix Voodoo Chile video. 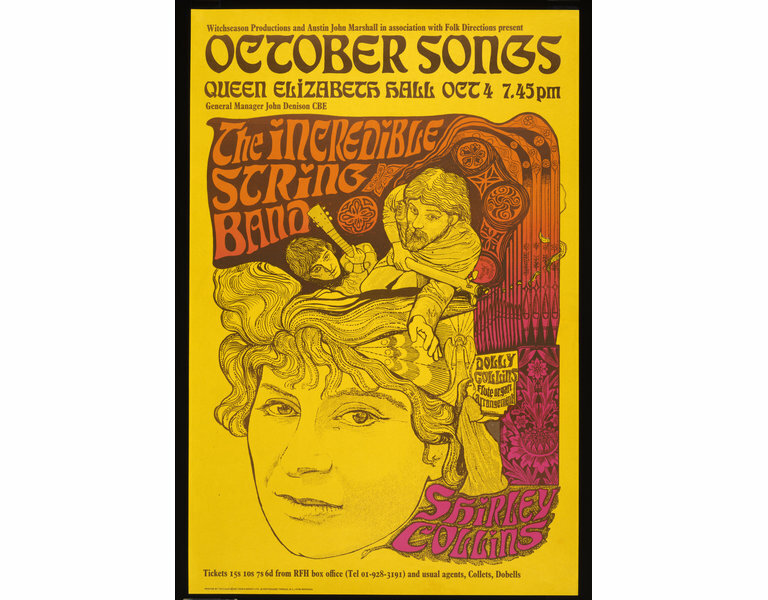 I do remember, it was at the Queen Elizabeth Hall, and Dolly and I were on the same bill as the Incredible String Band. We all got on. They were all wacky and high all the time I didn’t even drink at that point and I certainly never did drugs That was part of the problem with Davey, that he did of course. I couldn’t hack it. It was just not my thing. Then I was singing in the scene, but I wasn’t really part of the scene. Anyway, I think having met Joe and the Incredible String Band at this concert, I think the idea probably would have been rooted by John again. I was just singing and he was having the ideas at that time. I guess he sort of sweet-talked Boyd into producing and getting an album with Polydor. It was all so difficult talking to record companies at the time. None of them knew who you were or what you were doing. Austin John Marshall’s poster for the Queen Elizabeth Hall concert. 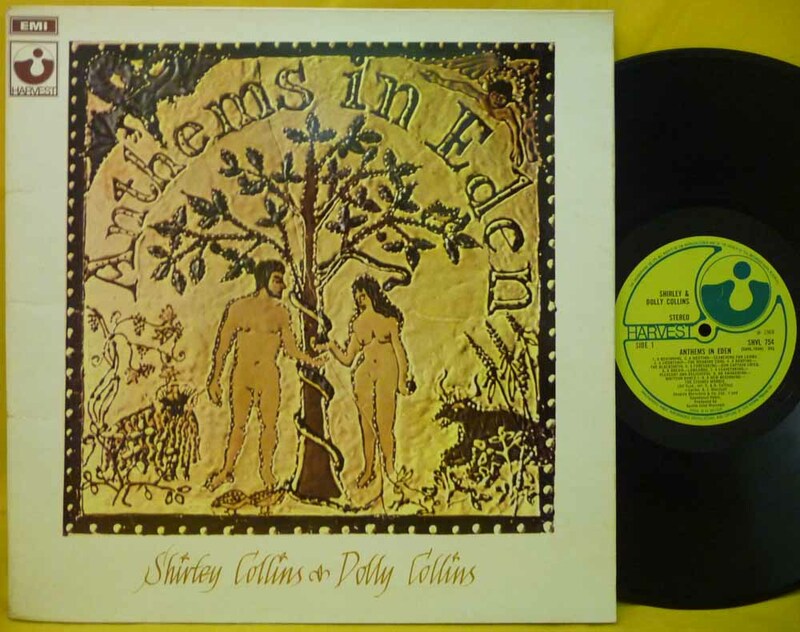 I remember I was fairly dismissive of Shirley’s 1967 LP for Polydor, The Power of the True Love Knot, resulting from her meeting Joe Boyd, describing it as presenting a false picture of life in the English countryside, “like Eden before the fall”. Joe [Boyd] was involved with that as well. I think we just decided what songs we would use and what story we would vaguely tell, because it’s not an absolutely crystal clear path through those songs Its just taking certain songs from before the first World War. I think the other thing that fascinates me in life are English churches. I love old churches and by an extension of those, I’ve always loved memorial stones. They’ve always had some sort of hook on me. I think this feeling was coming through all the time, I knew in England that maples were no longer around on the village greens as they had once been. More significant, perhaps, even than the choice of songs and Austin John’s LP cover artwork, was the way he put Shirley together with her sister Dolly, who played on True Love Knot, but by the time of Anthems, he had taken her along to meet Michael Morrow and David Munrow. I always loved [early music]. Uncle Fred, Purcell was his favourite composer. He also played us some Monteverdi as well when we were teenagers which I loved. It was the sound of that music that just completely spellbound me. I think my favorite music of all really is Italian Renaissance. I used to go along with John to rehearsals at Musica Reservata at the Early Music Centre. Anyway, it was there that we first heard the flute organ, and as I said it was transforming. There was David Munrow working with Michael Morrow. It was a bit difficult because it was his Musica Reservata that we were going along to listen to rehearsals of. I’m pretty sure David Munrow was part of that ensemble then, but then David broke away to form his New London Consort. I remember Michael being not very interested in what we were talking about, because we talked to him afterwards about the sort of music that I was doing and I think he wasn’t interested. I remember him as being a very somber man and not very approachable and I was quite nervous of him. that we could record this suite of songs with early music instruments with David as musical director. Austin John and Shirley were drifting apart, though he did produce her next album, Love Death and the Lady. I was breaking up with John then and the music pretty much reflects everything I think about, it’s all part of life. I was choosing songs that reflected how unhappy I was and how rigid I felt about things. One place Austin John could NOT take Shirley was into the jazz world. He floated a project for her to expand what she had done with Davey Graham into a collaboration with the New Jazz Orchestra, which had sprung out of sessions at the Green Man pub close to where he and Shirley lived in Blackheath. But Austin John was moving on. He was involved in a number of record projects, with bands like the Wooden O, with Spirogyra, and most notably with Steve Ashley; he produced Steve’s first album, Stroll On, and kept closely in touch with his career right up to the day John died. We worked more closely together. In addition to designing the covers for my Acoustic Music magazine, he also put me in touch with a source of finance for the mag. All the time he was working on his next, most major project, Smudge. “The rambling history of a certain Catchpenny Mole, junior clerk who, in 1914 is being set up to be­come The Unknown Soldier in 1918. On a country ramble in that fateful pre-war summer he is led by a ghost and a fortune-teller and a strange dream on a treasure-trove which becomes a journey of self-discovery. “There is a dreadful villain called Bartholomew Grubber; a heroine, Sweet Rosy Nature; an Organ-Grinder’s Ghost, Anony­mous Smudge; a comic lawyer and policeman; a man of the church. The Very Reverend Hush; and a judge, Doctor O’Thority. “Catchpenny Mole on his journey hears of dirty deeds in Grub­ber Hall, the sexploitation of Rosy Nature, and achieves, in a roundabout way, the downfall of the wretched Grubber. Blackbirds of Brittany, performed by Bert Jansch, one of only two “Smudge” songs ever to be released. Though I believe there may have been a BBC broadcast of the 100-minute folk epic, the only definite broadcast I know of was on WBAI in New York, in 1981, rebroadcast in 1982 and 1984. I have only scratched the surface of Austin John Marshall’s life and works. Dave Thompson has published a very well-researched obituary on the web: Austin John Marshall – remembering the Phil Spector of Folk Rock. Austin John Marshall’s story is one with the era in which he lived, loved, and worked. He is one of the giants with whom it has been my joy and privilege to walk along with. Perhaps someone will get the Smudge tapes over from New York, and release them. It would be a fitting memorial to great and generous friend. Tags: Alan Lomax, Bob Dylan, Davey Graham, Incredible String Band, Jimi Hendrix, Shirley Collins, The Great Smudge, The Whitsun Dance, Whitsun. Bookmark the permalink. My name is Arty Pellerano and I met Austin John Marshall in 1980-1981 I was a singer songwriter composer and John took an interest in my style and wrote me quite a few songs to record. Which I did on my own at home.We did record a song I wrote in the studio called socceror sound and John rewrote some lyric’s a bit to fit the Solidarity with Poland’s conflict with Russia. The song was Called “Poles Apart” sang by Felix Polinsky which was myself, I changed my name to support Polish.It was also aired on Wbai Radio. John was such a great writer. I composed and Produced music to his lyrics . If your interested in Reviewing them ,please get back to me at agingchildmusic@aol.com or you can call me at 201-951-3220. I feel the songs are great and need to be heard. Best Regards Arty Pellerano Sr.